So yesterday around 4:30 pm, Ava was officially put on the waiting list for a new heart, praise God!! When you are waiting for an organ donation in Ontario you are listed with Trillium, the gift of life network… http://www.giftoflife.on.ca/en/ a non-profit organization that organizes all the donations and recipients in Ontario. They have all of Ava’s information, her weight and length and any other info they need… so if her perfect match comes available, Ava can get a new heart! Now the thing about being put on the list for a heart transplant is that it’s NOT a first come, first serve basis. You are giving a rating that shows how much you need a heart, so you might have to wait longer for a heart if you are stable, because if there is someone who needs a heart desperately, it would go to them instead. And then the pool of available hearts is very small. A donated heart can travel four hours, whether by air or road, which is NOT a huge area considering that Ontario doesn’t have that many people. Sometimes hearts do come from the US, but not often. So hearts are hard to come by, and I can show you families at Sick Kids that have been waiting for hearts for 10 months and 6 months and it’s frustrating and tough, definitely not an easy wait. And then there are all the factors that go into matching a donor heart to a recipient. A big factor is size, you need a heart that is the right size of you. Now in a case like Ava’s, her heart is enlarged, so she can take a bigger heart than would normally do for her size, but you can never go smaller than the size your own heart would be. 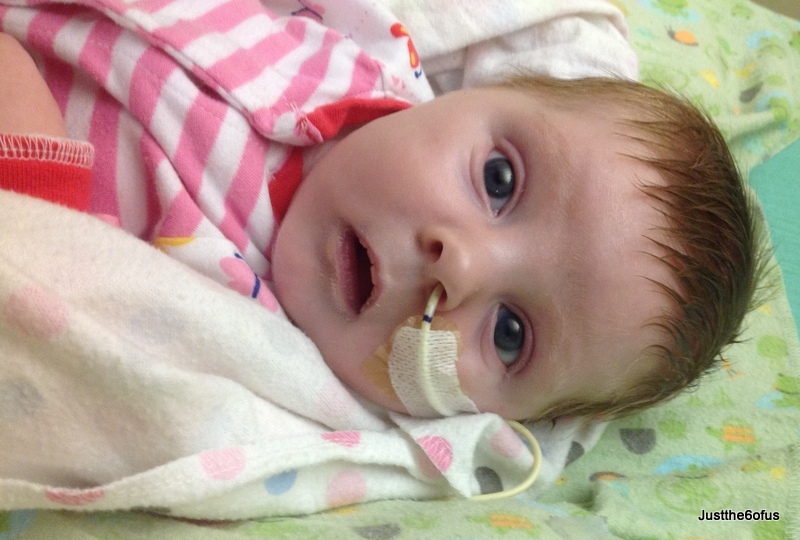 Blood type used to be a factor for infants, but years ago Sick Kids pioneered ABO incompatible heart transplants for infants under 18 months of age, so even though Ava is an O blood type, she can receive an A or a B heart. Another complicating factor is that kids like Ava who have a congenital heart defect often times have blood vessels that aren’t normal. In Ava’s case, her main pulmonary artery was fused with the upper part of her aorta when she had her Norwood surgery; so when Ava gets a new heart, she needs it to come with an intact pulmonary artery and aorta as well. The problem is, if that donor also is also donating lungs, we probably wouldn’t be able to have the pulmonary artery, so that heart would have to go to a baby who didn’t need those extra blood vessels. So as it was explained to us, the odds of receiving a heart perfect for you is like winning the lottery…. and that is what we are up against. But we serve an amazing God, and we know that if He wants Ava to get a new heart, He will provide one, so all our hope is in Him. And then there is the heart-breaking part of all this; we know that another family will be going through a devastating loss of a child, at the same time that we are rejoicing that our child is receiving the gift of life. But I like how Jason put it, we aren’t waiting for another child to die, by the time the family is deciding to give the gift of life, their child has already died. And that is something that we have absolutely no control over, nor do we wish it for anyone. But it certainly has made us look at organ donation is a different light. I understand that if you just lost a child, donating their organs would seem like an extremely difficult decision, but for people on the other side like us, a donation would mean the gift of life and we would be grateful for that gift for the rest of our lives. So the wait begins, for a new heart for our baby. And even tough it’s going to be challenging times ahead, we still know God has a plan for our little Birdy. Needs to grow into her shunt! She finally had her echo-cardiogram this morning and praise the Lord her heart function looked good – which is such a relief because that had Jay and I really worried. But now that they have ruled out that her heart isn’t working too hard, they’ve basically said that she is sending too much blood to her lungs because the shunt is too big – too big on purpose because it won’t grow and she will – and that is why her oxygen saturation’s are at higher levels than they would like to see for a baby who has had the Norwood heart surgery. So the consensus today on rounds was that we have to stay here at the hospital until Ava grows into her shunt! Oh man! So does that mean days, weeks or months? I have no idea. Thankfully another cardiologist came by this afternoon and said that they really don’t want to hold us hostage here, and that if Ava is doing well in all other areas, that they would discuss her case with the team and hopefully we might be able to go home, even though we would not meet the protocol for sending home single-ventricle baby’s. So all we can do now is pray and make Ava eat… lots. And that’s not easy because although her tummy handles my milk just fine, she can’t gain weight on it because it doesn’t give her enough calories and she uses up more calories than a normal baby would just by living. And unfortunately her little tummy just can’t handle the extra volume she would need to make up for this – when they have tried to increase her volume she just throws it up, even though she gets fed over an hour. So they supplement my milk with condensed formula for calories, but she doesn’t tolerate that well either, so she still hasn’t gotten up past her birth weight of 8 lbs, even though she gets fed every 3 hours around the clock by her ng tube. And it’s breaking my heart, but she’s having a hard time even sucking on a soother without gagging and retching so please pray that we can get over that hurdle so that she could start to feed orally… the occupational therapist was here again this week trying to get Ava to take a bottle but didn’t get too far, plus it really tires Ava out. But her little vocal cord is starting to heal because Ava is getting louder every day, so hopefully we can do a feeding study before we get out here to see if Ava can drink non-thickened fluids without aspirating – and that would open the door up for breastfeeding. So many hurdles to jump over. And it’s so cool to see Ava start to meet these milestones, even though her prolonged stay in the critical care probably set her back bit. But back to my parents, it was so great having them here last weekend and then we were blessed even more this week when friends came to visit us yesterday and today. We can’t tell you how much we enjoy these visits. Our kids love seeing friends and Jason and I love it and it just makes us feel closer to home. Just like when people send us emails or even leave comments on the blog, we find it all so encouraging, even though we might not always find the time to respond back. So we are just going to get into a groove and take things day by day and pray that Ava will grow! We are very pleased to report that they closed Ava’s chest today just before noon and she seems to be doing really well. She’s not out of the woods yet – between 12 and 24 hours things can get dicey – but we will just continue to pray pray pray!! Here she is looking a little more normal again which is such a relief! And today has been a much better day over-all, praise God. 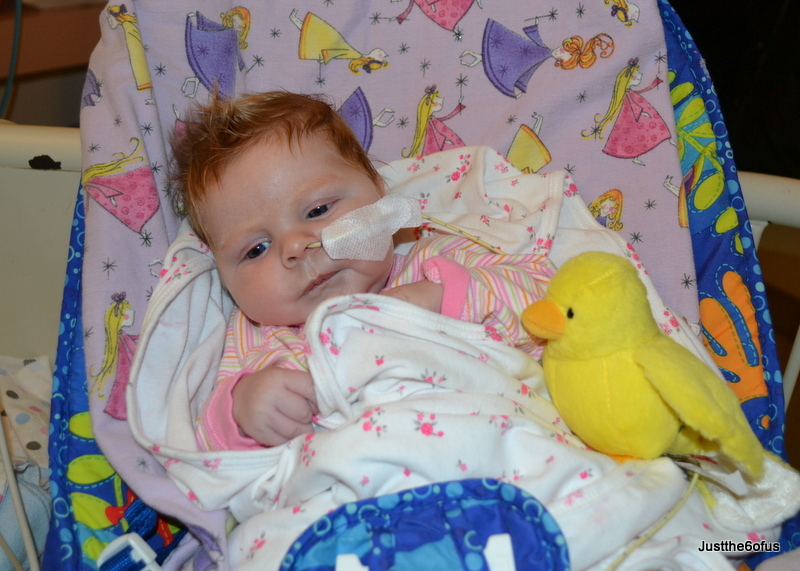 Oh my little Ava – please Lord – please keep her steady over-night and let her chest stay closed!! So life here really is like riding an emotional roller-coaster. There can be such ups and downs and I won’t lie, it’s very tough and emotionally draining and that might be why I just ate a ton of chocolate … chocolate is very very very good. And of course, the timing of these roller-coaster rides is always bang on, it seems to get you when you are already tired and wound up. See we were visiting Ava last night around 9:00 pm and happily chatting with her nurse, when all of a sudden the baby next to us went into cardiac arrest. Our nurse ran to this baby’s side, the room filled up with people and I just started praying like crazy, but as those parents started to sob, we left and didn’t end up being able to go back and see Ava again for the night. That was a horrible experience. We were pretty shaken up. 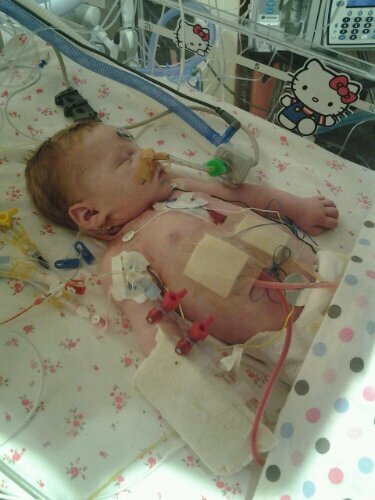 Thankfully that baby was OK, didn’t die and after talking to her parents today they said that they think think she had a blood clot since she had just had surgery yesterday. Thankfully she was able to be stabilized and has had a fairly calm day today. But it meant we started today perhaps a little more keyed up then usual. And then of course I posted about how they were going in to remove Ava’s stent that was keeping her chest open and hopefully close her chest up. And they did close her chest. For about 20 minutes. Then they came and told us they had to open it again. She wasn’t tolerating the close, her heart rate had climbed and wouldn’t come down so they had to open it again. Now we are back to square one and it’s disappointing. So a day like today doesn’t make any sense to me, but we can still trust God in this, we can! I’m thinking in my own human terms, but God has his own plan for Ava, we just don’t know what it is. To God be the glory, a baby’s chest closed today or not.